National Public Gardens Day is this Friday, May 9! This annual celebration of the nation’s public gardens aims to raise awareness of the important role botanical gardens and arboretums play in promoting environmental stewardship, plant and water conservation, green spaces, and education in communities nationwide. 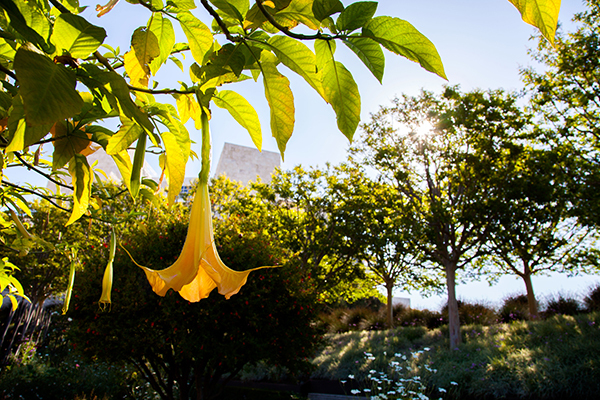 At the Getty Center and Getty Villa, we are celebrating by offering special garden tours, highlighting the incredible aromas that emanate from our gardens. 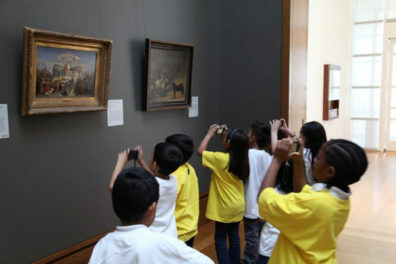 The tour at the Getty Center will be at 10:30 a.m., and the tour at the Getty Villa will be at 2:30 p.m. They’re free, no reservations required. Our horticulturist Michael De Hart gave me a preview of what you can expect at his aromatherapy tours. Next time you’re at the Center, just follow your nose and discover the following fragrant flora! 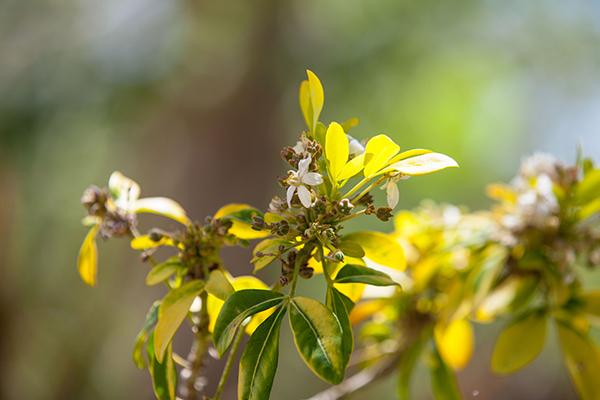 This sweet-smelling flowering plant is native to eastern and southeastern Asia and can be found all over the Getty Center, not just in the Central Garden. A valuable perfume oil can be extracted from the flowers and a diluted form is often used in Chinese, Vietnamese, and Thai incenses. Flowering usually begins in May and continues through June. Not all aromatic plants smell good! Rue has a disagreeable odor, but many uses. 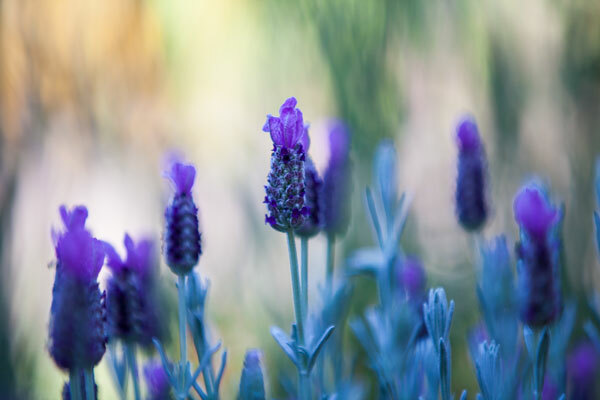 Native to the Balkan Peninsula, this herb is grown throughout the world as an ornamental, valued for its bluish leaves and its tolerance of hot and dry soil conditions. The ancient Romans used it as an astringent for muscle aches and sore joints. It can also be used to give a distinctive bite to salad dressings. 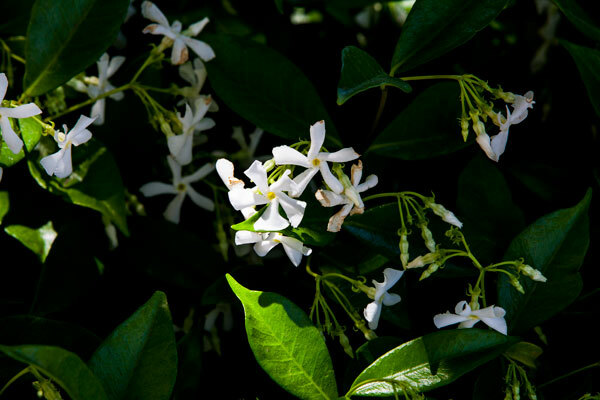 This shrub, which produces small, white, sweet-smelling flowers, is named for the similarity of its flowers to those of the closely related orange, both in shape and scent. They are popular ornamental plants in areas with mild winters, like ours. 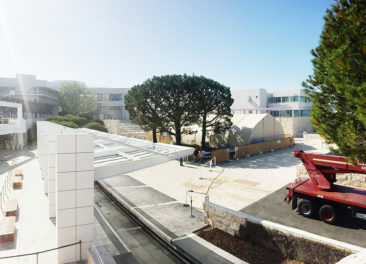 The Central Garden at the Getty Center is home to 16 varieties of roses, ranging in color from white to red to orange and beyond. Most species are native to Asia, with smaller numbers native to Europe, North America, and northwest Africa. 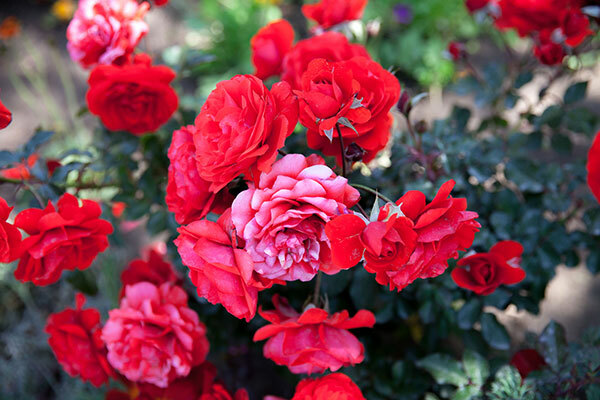 Roses are widely grown for their beauty, are often fragrant, and different colors have held special meaning since ancient times. 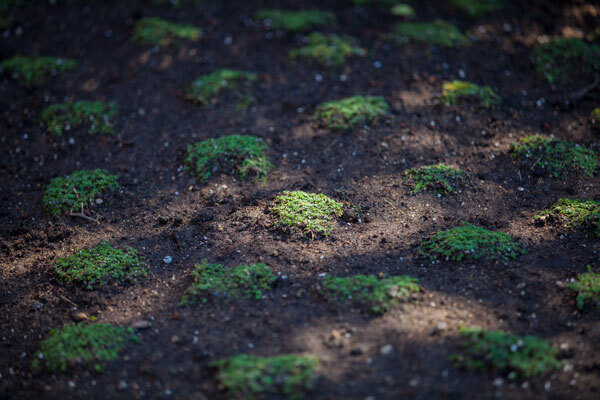 This subspecies of the thyme plant has highly aromatic leaves and makes an excellent ground cover. 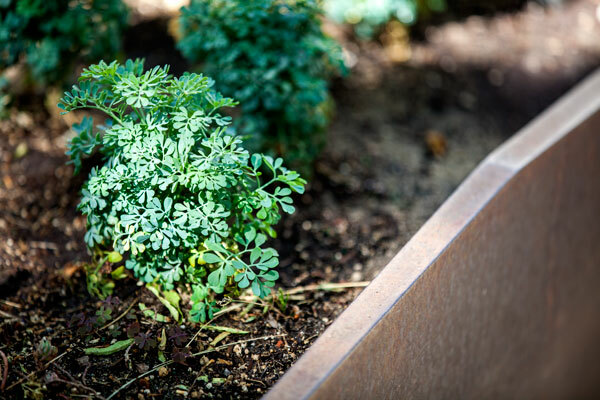 It tolerates drought and poor soils, and flourishes in loose, sandy, or rocky soils with excellent drainage. Thyme is used in everything from cooking to the relief of sore throats, and is great for attracting bees. This little gem of a flower was a new discovery for me, and immediately became one of my favorite scents. It’s an annual native to Sicily, southern Italy, and the Aegean Islands. 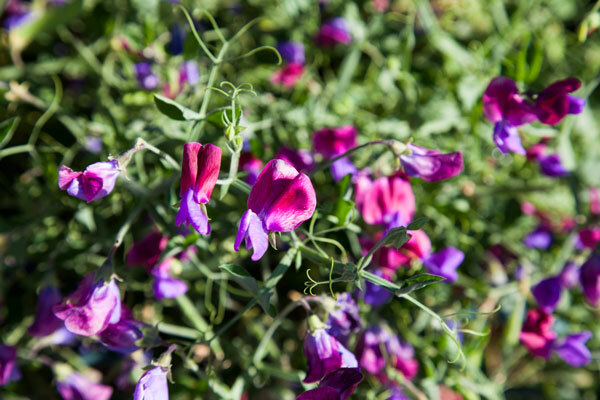 Sweet pea’s delicate flowers span pastel shades of blue, pink, purple, and white and emit an intense, delicious aroma. The Angel’s Trumpet is a large shrub or small tree with picturesque branched form that’s native to tropical regions of South America. The plant is named for the shape of its oversized flowers, which hang down dramatically from the branches. The flowers release their sweet-smelling fragrance only in the evenings, in order to attract pollinating moths. 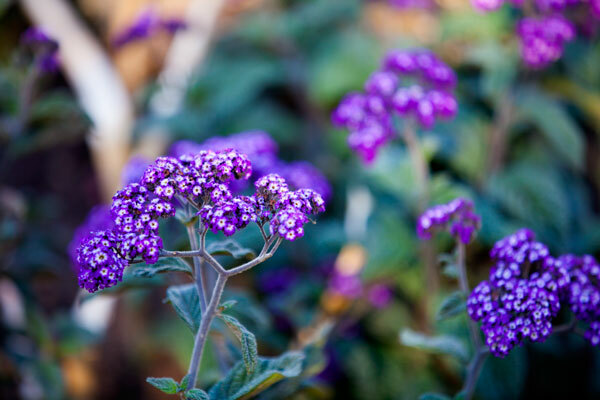 Heliotrope is a highly fragrant perennial plant, originally from Peru, with an intense, vanilla-like fragrance. It gained great popularity during the Victorian era in England, often appearing in gardens and decorative borders in parks. 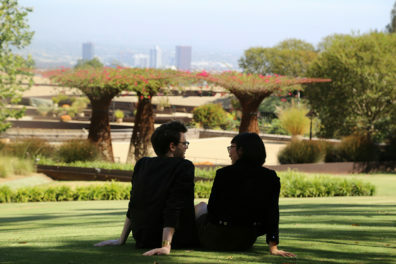 Have you been to the Central Garden? What are some of your favorite plants or scents? They’re so numerous, I couldn’t cover them all in one blog post, and would love to hear from you. What are the light greenish, spiky-leaved plants bordering the circular walkways around the pool? Its scent was unusual and pervasive. It was perfectly placed. I could have spent many more hours in the garden. Thank you for the garden and for this article! “Society garlic”. It’s pungent aroma is more an odor than a fragrance. What is the climber with the lovely purple flowers in the Central Garden that are flowing at the moment?